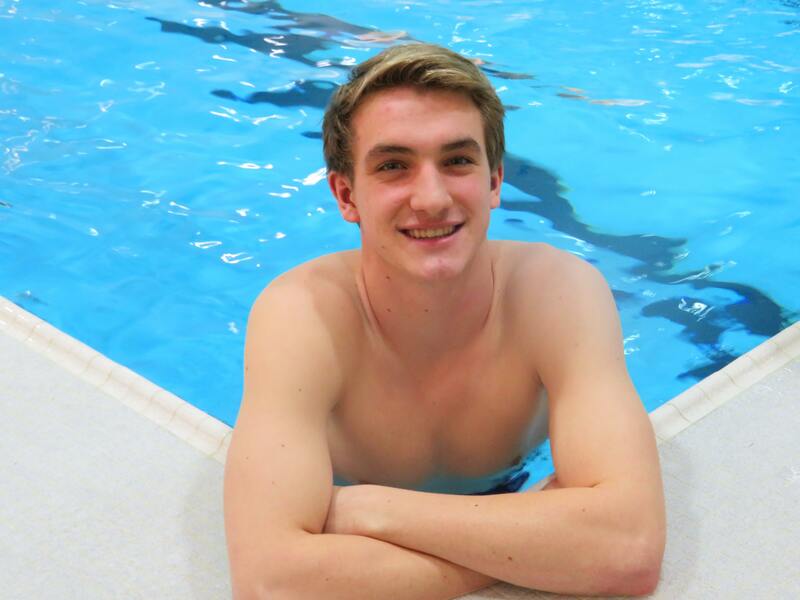 Things have really turned out well for Brookfield East senior Ben Attenberger, who really didn't like swimming when he first tried it. "I think the reason why I ended up doing it were my parents were like 'Just try out and do it,' he recalled. "At first I really didn't like it. I just kind of did it because my friends were in it. It was just a fun activity. But then I was progressively getting better at it than all my other sports. I wasn't very good at basketball and soccer. Swimming just kind of took off for me, so that's why I kept doing it." To say it has worked out well for Ben is an understatement. He received a scholarship to the University of Wisconsin - Madison to swim for the Badgers. Last season as a junior, he finished fourth in the 200 individual medley and fourth in the 100 breaststroke at state and was third in the 200 relay and sixth in the 400 freestyle relay. As a sophomore he was fourth in the IM and fifth in the breaststroke at state. He is the school record holder in 200 IM and 100 breaststroke as well as part of the school record 200 medley relay. He qualified as part of the 400 free relay as a freshman and finished eighth. "So far this year he's ahead of our expectations," coach William Twitchell said. "He typically swims strong during the season and then he really comes on at the end. So if he has a similar pattern this year he's in a better position than he's ever been before." Ben began his swimming career in Michigan, then took it to China and is finishing it in Brookfield. "We've kind of lived all over the place," he said. "When we lived in Michigan, I started in like a summer league when I was 8 years old. Then we moved to China and we lived there for four years. That's when I started getting better at it. "I swam with the school and I competed there and I just progressed from there. When we moved to Brookfield I joined the Elmbrook Swim Club." Twitchell didn't know a lot about Attenberger but he quickly saw he had a special swimmer. "Pretty much day one," he said. "I found out he came from China and I started asking around. He's a very precise and polished swimmer. That doesn't just happen by accident." Despite his past success in the 200 IM, Attenberger switched to the 200 free this year, to go along with the 100 breaststroke. "As much as I liked the 200 IM, I think I have potential to do well in the 200 freestyle," he explained. "Because of the club season, I swam it on a relay once and I actually did really well. I thought I might as well as do it this year, because I don't know what I'm going to do in college except for the 100 and 200 breaststroke. My third event could be the 200 free or the 200 IM, so I thought I might as well try the 200 free." Attenberger then talked about the different strategy in the 200 IM and the 200 free. "I've think I've done well it's just kind of a different race," he said. "You can race your opponents differently than doing the 200 IM. The 200 IM is based on what stroke you're good at. I would strategize the different strokes with the power to get ahead. I would power the breaststroke because that's where I would excel at the most. "The 200 freestyle is a completely different race. I always thought I had a good stroke with it. It's more maintaining the endurance to get through the race. I like the different aspect of that, going in all at once." Attenberger is ranked third in the state in both events so far this year. Twitchell talked about why Attenberger is successful in those events. "He's always been a tactician; he's always swam very smart," the veteran coach said. "So that translates to efficient, which translates to a good race strategy. "Plus he is also a big strong kid. For a swimmer he's got the prototypical power plant. Big broad shoulders, strong upper body and slender toward the leg. He's like a little Michael Phelps. He's built pretty well." Ben spoke freely about his strengths and what he needs to get better at. "I feel I'm strong doing my turns," he said. "I feel my underwater is the best part of my racing. I also feel like my technique is also good. I have a nice look to the stroke. I try to stay within my stroke range. If you're efficient while you are in the water, you will have more endurance for the end of the race." Ironically, it's the basics that Attenberger feels he needs to work on. "Some of my basic fundamentals of my swimming are off," he said. "My dives aren't that great. Sometimes I'll take breaths like I don't need to. Basic answer, but I struggle with the basic stuff. You master the things that are harder, but I struggle with the basic stuff." Twitchell got right to the point when asked about Ben's strengths. "Consistency of his practice," he said. "Intelligence in his race. His strength. He's a very strong athlete. Very efficient. I think his future is very bright. I don't think we've scratched the surface. Matter of face, I'm quite excited to see what he does at the collegiate level because I don't think we've tapped his real competitive fire. "I think he will be able to make some big steps at the collegiate level. He's done everything that we asked him. I'd like him to be a little more aggressive but that's just not in his nature. He's a chess master. He thinks one move ahead or two moves ahead. He's not a bull in a china shop." Ben talked about his thought process when it comes to a race. "Sometimes I feel pressured to perform against other people," he said. "But I have to realize what's in my capability and what's in my control. What other people are going to do that's their choice. What I'm going to do is my choice. Sometimes I forget that. When I do remember that I swim my best. "Sometimes I'm competitive and sometimes I'm relaxed. I do feel I'm competitive with myself." After all this success, Ben talked about his progress this season. "I'm more motivated than ever," he said. "I'm a Madison commit, so being one of the leaders on the team I have to step up. But we have a lot of leaders on the team - Max Schroeder, Gus Brunette and me. All three of us lead in all different ways. I feel we've stepped up." Twitchell talked about Ben as a leader. "Ben is the strong silent type," Twitchell said. "He doesn't seem to be demonstrative with his voice, but he is consistent in his effort, especially in practice and is one of our harder working athletes. Also his race ability. He brings a poise to the competition that maybe some of the other kids don't have." Twitchell was asked where does Attenberger rank among the all-time swimmers for Brookfield and he admitted the ending is still to be written. "He's in the top five best athletes in swimming on the boys side," he said. "I can count on one hand the number of boys he's in company with. And all of them had great careers and beyond. The future has yet to be seen on where he fits in that pecking order." FAVORITE MOVIE: Sixth Sense, SciFi, Friday, Comedies & Drama. WHAT DO YOU DO TO RELAX? Watch TV. MOST MEMORABLE SPORTS MOMENT: Going to state as a freshman. WHAT WOULD YOU LIKE TO DO IN THE FUTURE? Attend University of Wisconsin - Madison. Swim for the Badgers. Go into Business School (Marketing).